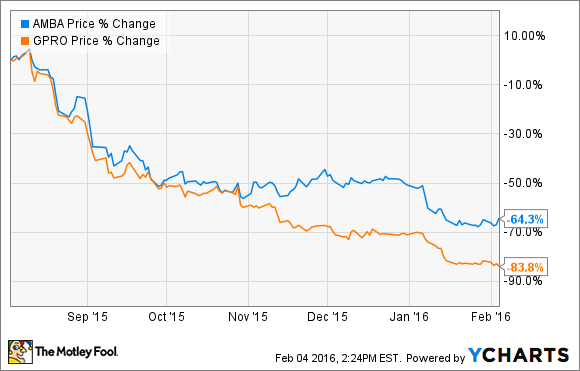 GoPro can be blamed for most of Ambarella Inc's woes last month. What: Shares of Ambarella Inc (NASDAQ:AMBA) fell 29% in January according to S&P Capital IQ data as one of its biggest customers struggled with weak demand. So what: GoPro's (NASDAQ:GPRO) terrible fourth quarter took Ambarella down with it, and as you can see below, the two stocks have traded in tandem most of the past six months. When GoPro announced in January that it would see declining revenue in the fourth quarter and was cutting about 7% of its staff, it was thought that Ambarella would take a hit on its demand as well. While GoPro is an important customer for Ambarella, it isn't the company's only customer. TASER International launched its Axon 2 body camera late in 2015 with an Ambarella HD camera System-On-Chip and launched a new chip for drones at CES last month, a booming market for Ambarella. Now what: While the struggles at GoPro are real, I don't think there's anything fundamentally broken about Ambarella's business. Video is a growing part of the consumer landscape, and the company is winning business in everything from action sports to drones to security. With shares now trading at 15 times trailing earnings I think this is a great growth stock for investors, despite the market's bad feelings about the business lately.